The iPad mini is selling well and Apple might be thinking of adopting its narrow bezel design for the big iPad too. 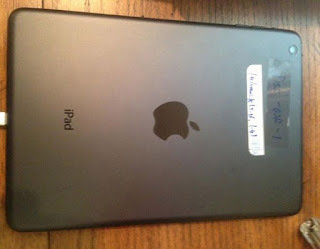 Photos of a prototype iPad 5 along with cases for it have leaked, but we only have someone’s lap to give us a sense of scale (otherwise it might just be an iPad mini, take this with a pinch of salt). The iPad uses a 4:3 screen, which makes it quite wide and the iPad mini got around that with very thin bezels on the left and right of the screen. These photos suggest the iPad 5 will borrow this design plus a few other things – there’s no loudspeaker on the back, but the cases do have a pinhole near the camera (presumably a microphone). The plastic RF window on the back blends a lot better with the rest of the back like on the iPad mini rather than the 9.7″ iPads. The iPad 5 will be 15% thinner than the iPad 4 and 25%-33% lighter. Part of the thickness and weight saving is said to come from the use of only one LED backlight bar instead of two. Other rumored specs include an Apple A7X chipset, 8MP camera, storage that goes up to 128GB (16GB supposedly will cost $500) and the tablet will support smart gestures and wireless charging (an old rumor also mentioned wireless charging in Apple products).